Whether your business is large or small there are some simple and free ways to show your customers you make a difference. By partnering with the team, you will get access to some great photos, amazing stories and even bespoke testimonials. Our everyday heroes work in businesses just like yours, so we understand what needs to be given back by a charity relationship. As a small charity based in your community we can offer a way to excite your staff, differentiate your brand and give back locally. In return for any donation your company will be invited to use any of the resources on this page to promote itself. You can generate a press-release, download a thank-you Certificate to display, use our posters and pictures and encourage staff to fundraise further using our tools. In return for a donation of £500 (or equipment to the RRP of £500), we will display your company details on our website for six months, and give mentions on our Facebook and Twitter feeds. You will be allowed to display our Supporter Logo for any approved marketing use during this period and state that you are a supporter in your marketing. In return for a donation of £1,000 (or equipment to the RRP of £1,000), you’ll receive all of the above, plus a full report/testimonial back on the use of any equipment or a statement for your marketing use. We will also help with a press-release regarding your donation. Your logo and a link will be displayed on the website for one year. You will receive an invite to a team open-day, exclusive to Gold Supporters, where you can meet some of the team and see our kit in use. In return for a donation of £5,000 (or equipment to the RRP of £5,000), you’ll receive all of the above, plus your team will be invited to attend an exclusive sponsor’s event, where our members will demonstrate search techniques and treat your team to a great half-day with photo opportunities with the team. Your logo and link will be displayed on the website for two years. Why not host a collection tin! charity to make a sustainable income is a static collection tin for your customers’ change, or even as a swear box for the office. It costs us very little, and provides a steady income. In a competitive marketplace, customers like to buy in to brands with a social conscience. We’ve prepared a certificate of recognition for you to print and display in your shop or office, to let your customers know that you give back to the local community. Download our Sponsors pack above for your certificate. You’ve done a great thing by supporting a small local charity – tell your fans! 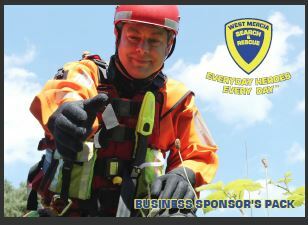 We encourage you to download and repost any of the images in our Photo Library (Click here) to use in your marketing to say you support West Mercia SAR. We find that the best response from press releases is to think local. Find out your local newspaper, parish magazine, town newsletter or radio station and send it to an individual. Then follow up with a phone call asking if they want any more information. Send the press release as a plain email (not a word file or PDF) so it can be read quickly. The press are allowed to use our photos with a credit to West Mercia SAR. Don’t say too much. Use our template press release and change it to your needs. Make sure you mention your businesses values and why you are supporting locally. Add the same press release to your website and social media! Your customer list is really important for generating loyalty, and customers love to deal with companies that make them feel good about themselves. Get your customers involved by letting them know that a small percentage of what they spend with you goes back to a great local cause. And tell them about that cause – use the text from our website, and the photos from our library, to create a story about why you give back locally and what it means for you to be part of the community. If you don’t have a mailing list, we recommend starting one at www.mailchimp.com – it’s free, and you can generate simple sign-up forms for your website, social media, emails and in-store. Feel free to print out images from our photo library to give your staff (or customers) something to talk about and remember they’re part of a wider community. They make great, bright posters. Build team morale by organising sponsored events, having a swear box, dress-down days… whatever you can imagine. We have paper sponsorship forms and loads of helpful information here.